A sunny day yesterday with a perfect downstream breeze, although too bright and not ideal conditions we all enjoyed soaking up the wonderful scenery on Mid Summers day. Bob C led the way at Middle with five fish, and again came into breakfast this morning with two on the bank and one lost from Generator - which had also fished well last night once the sun went down. 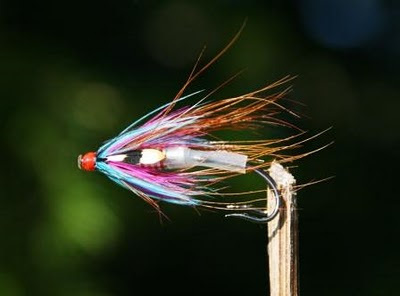 Small Shrimp patterns continue to be favourite on floating lines. 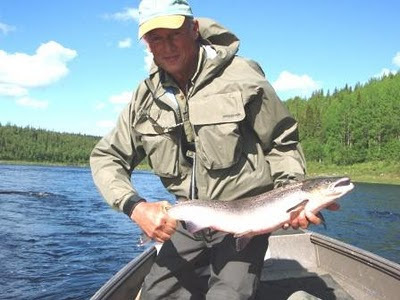 Up at Pana Guy Rasch had seven out of 19 salmon landed, I hear he has been top rod two days running. With the water quite warm at 16°C and the fish holding well out in the river our fishers have been bolder at wading these last couple of weeks. Last week Charlie’s team from Belgium set some swimming records here at Middle, rumour has it they were practicing for the Synchronized Swimming competition. We are catching up, Mark M from Team Wales caught the judges eye with a 40 yard graceful back stroke down Blue Rock, Luke C-M tried Duck Diving and Piers F-A continues to impress for the ‘Wading like a Baby Giraffe’ award. The Swiss and Irish teams have been practicing in the shallow end but to date we have not seen their full potential. This morning I found, deep in Tiffy P’s fly box, a very rare commodity – the last Wilkinson’s Shrimp on the Kola (shown below) tied for me last year by Peter Nightingale on an experimental aluminium tube. I got some stick I must admit for Tiffy had suggested she start with this fly three days ago. A suggestion I dismissed out of hand in favour of a Dee Sheep. I am now eating very humble pie – I have been sacked as Tiffy’s guide and confined to camp, the Wilkinson Shrimp has been taken on an outing to Madonna’s. Tiffy has recruited two new guides for this mission, Anton and Dave, to land the many fish she will no doubt catch.